Jenny Jones, a native of Charlotte, North Carolina, began studying Suzuki violin at the tender age of 3. By the age of 12, she began taking lessons from the North Carolina School of the Arts studying with Stephen Ships and Kevin Lawrence. 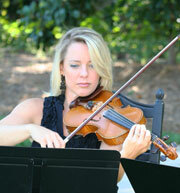 Jenny attended Appalachian State University as a Fletcher Scholar and majored in Violin Performance. While attending college, she participated in several surrounding orchestras including Johnson City, Kingsport, Western Piedmont, North Carolina Symphony, Charlotte Symphony, Union Symphony and the Charlotte Philharmonic. She has played throughout Europe and has earned numerous awards during the span of her violin career including two Young Artist Competitions and the Concerto Aria Competitition at Appalachian State. Jenny currently resides in Harrisburg, NC with her husband Brian and their 3 sons. She continues to play professionally throughout the Charlotte Region. 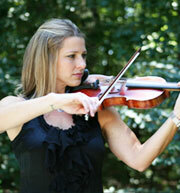 Becky Thoms has over 30 years experience in violin performance. She began studying under the Suzuki method as a child and continued her studies as a student at the North Carolina School of the Arts in Winston Salem, under the direction of Kevin Lawerence. She attended the University of North Carolina at Wilimington where she performed on a continual basis with the Wilimington Symphony. Becky has performed with several surrounding orchestras including the Charlotte Symphony and Charlotte Philharmonic and served as the Concertmaster of the North Carolina District Symphony and has been featured as a soloist. Becky has not limited her performance experience to just orchestral playing, she has also performed for music videos and has traveled throughout Europe performing in many Cathedrals and other venues. Becky continues to play throughout the Charlotte region and performs monthly with a musical ensemble named Magnify up in the Cornelius area. She currently lives in Waxhaw, NC with her husband and 3 young children. Jean is originally from Sarasota, Florida where she began her musical studies at the age of 11. Growing up in the youth orchestra program, attached to the symphony in Sarasota, is where she found her love for playing the cello and making music. Jean received her Bachelor’s degree in Music from Columbus State University where she underwent extensive training in cello pedagogy as well as cello performance with Martha Gerschefski. 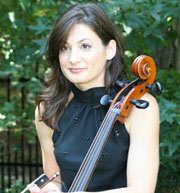 During her studies at Columbus State she was awarded the Edwin and Ina Gerschefski award for violoncello. Jean went on to earn her Masters of Music Education Degree from Florida State University. Jean was an Orchestra director for five years teaching 5th-12th grade orchestra. During this time, she also maintained a private cello studio and free lanced in many orchestras. Upon marrying her husband Jason, Jean left the school system to continue her private cello teaching, adjudicating for various festivals and competitions, youth orchestra coaching and cello performing full time. She has had many private students go on to receive full tuition scholarships to study music in college. Throughout her career, Jean has performed with the LaGrange Symphony Orchestra ( principal cello), Albany Symphony Orchestra, Tallahassee Symphony Orchestra, Spartanburg Philharmonic, Brevard Chamber Orchestra, Salisbury Symphony, Union Symphony and The Greenville Symphony Orchestra. Jean currently resides in Mount Holly, NC with her husband Jason. When she is not playing with The Queen City Ensemble, Jean maintains a private cello studio, plays with the Greenville Symphony Orchestra, and freelances.